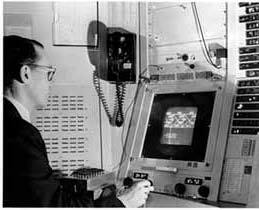 Sketchpad was an innovative system developed in 1963 by Ivan Sutherland as part of his PhD thesis. It is a tribute to Sketchpad's uniqueness that it defined a GUI (Graphical User Interface) more than 20 years before the term was first used. Sketchpad was developed at MIT's Lincoln Laboratory on a TX-2 computer. The computer was very advanced for its time and had 320kb main memory, an 8Mb magnetic tape storage device, a 7 inch 1024x1024 monitor, a light pen and a button box. As with most computers of that era, programs were written in macro-assembler, punched onto paper tape and fed into the computer's paper tape reader. The computer occupied about 1,000 square feet (~93 square meters) and the 320kb memory core alone was ~1 cubic yard (~0.76 cubic meters). if the master drawing was changed then the changes would automatically be propogated through the instances in any duplicates. Sketchpad's drawings were created, duplicated and stored at 2000:1 scale which allowed very large layouts. Sketchpad proved beyond doubt that computers could automate repetitive design and drafting tasks with a reliability and accuracy not possible by manual methods. Possibly of even greater significance and sadly almost ignored in the CAD software market in the 40 years since Ivan Sutherland published his thesis, Sketchpad proved that computers can be used not just for engineering and repetitive drafting but can be used interactively by designers and potentially artists in the concept creation and innovation stage of a product's lifecycle. Ivan Sutherland's PhD thesis was reprinted in 1980 under the title "Sketchpad: A man-machine graphical communication system". An electronic edition (3.9MB PDF) was published in 2003.